For the next 10 days I'll be posting my favorite memories from Monday Night Raw as we count down to the 1,000th episode. I am basing my list on the things that I still remember after all these years. I did not go online to look up anything (other than the photos and videos). My list may be obscure, but hey I'm not a "normal" person anyway. I also have more than 10 moments that I wanted to share, so I'm going to write my 10 favorites and then 5 "honorable mentions". I should also state for the record that I started watching Raw when it debuted, I was in college and it became a Monday night tradition for me to head down to the pizza restaurant on campus and watch with a few other fans. My #10 memory comes during that first year of Raw. It was December 1993 and Gorilla Monsoon "fired" color commentator Bobby "the Brain" Heenan. The former manager was set to leave the company and his departure was one of the most significant to me. No doubt Heenan is one of the greatest personalities in all of wrestling and to see him leave my favorite company was sad to me. At the time I wasn't sure he was headed to WCW (this was before the internet), but when he did arrive there I did find some comfort. But let's face it, I don't think he was the same Brain as he was in the WWF. 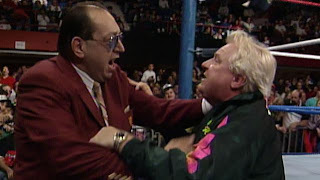 The night Monsoon fired Heenan, he gathered all his belongings and tossed them outside the arena. Heenan was then tossed out after them and the door locked shut. The camera stayed with the Brain as he tried to gather his items and started crying. It was the end of an era in wrestling and the start of the big name stars heading to WCW. Hulk Hogan, Randy Savage, and countless others would soon be following suit. Honorable mention: This is your life. Honorable Mention: I may catch flack for making this an honorable mention and not one of my top ten, but the "This is Your Life" segment with the Rock and Mankind has landed here. I enjoyed the segment, and obviously the fans did too as it is still the highest rated segment in Raw history. Maybe I'm wrong, but I don't remember this leading to any lasting results in the WWF at the time. This was during the Attitude Era and honestly my memories of this time starts to get fuzzy as there was SO much wrestling on at the time I had a hard time remembering all the events that happened then. But the bottom line of this story was that the Mankind was trying to get into the Rock's good graces and brought back several blasts from his past. 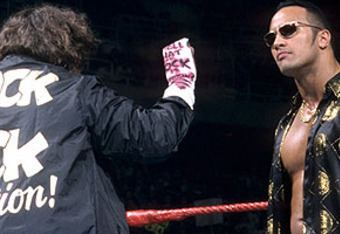 The Rock systematically ran down everyone Foley brought to the ring. The segment came to an end with Triple H hitting the ring with a sledgehammer. Stay tuned, more memories will be shared tomorrow. Be sure to like us on Facebook and check out My 1-2-3 Cents on YouTube.